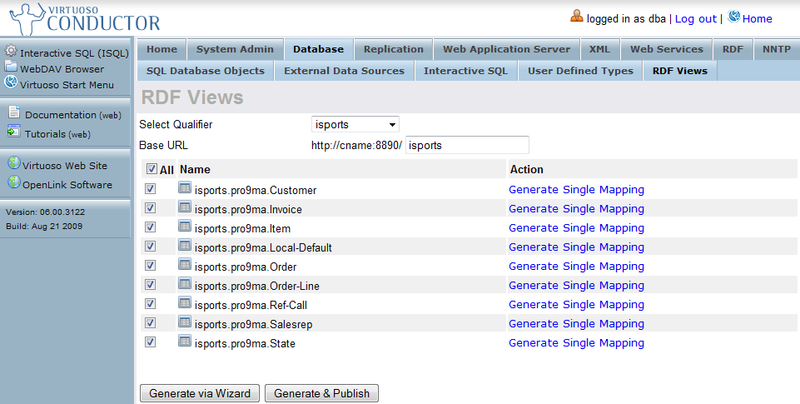 This document details the steps required for building RDF-based Linked Data views of schema objects in Progress data sources, using the sample isports database. Go to the Virtuoso Conductor (http://<cname>:port/conductor). Note, the appropriate cname (hostname) and port number for dereferencing URIs must be set for the URIQA:DefaultHost Virtuoso configuration parameter before creating the Linked Data Views. 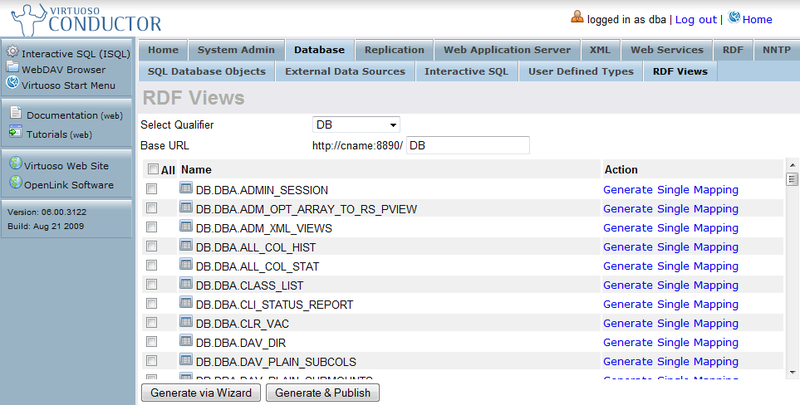 Log in as user dba (or another user with DBA privileges). If not already done Link the Progress tables into OpenLink Virtuoso. 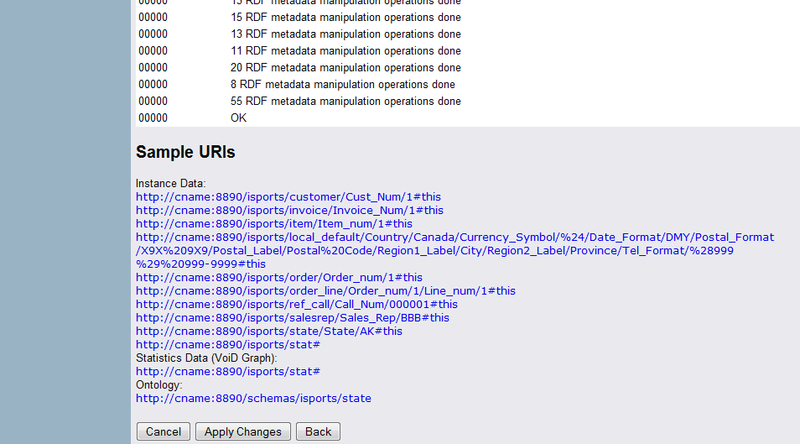 Select the Database Name Qualifier (e.g., "isports") that exposes the Tables / Views for this exercise. 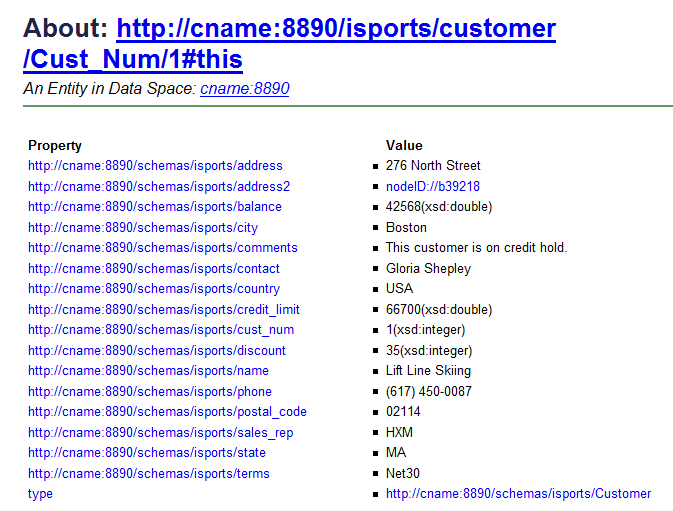 Enter the Base URL to which your URL rewrite rules will be bound (e.g., http://<cname>:8890/isports). Select the specific Tables containing the data to be published. Choose Generate via Wizard to perform a custom generation and continue with Step 9 or choose Generate & Publish to perform a one click generation of the Linked Data Views, in which case skip to Step 17. At this point, you are presented with the option to edit your column selection. 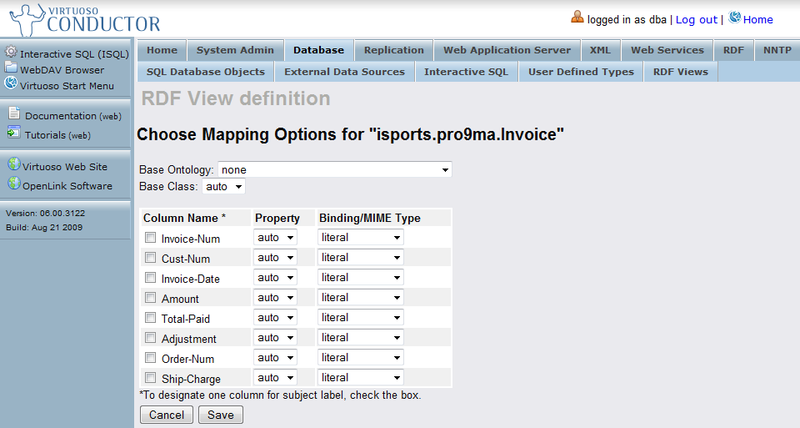 Select the "Edit" link, for example, for table isports.pro9ma.Invoice. Select the binary object value in order for the column to be referenced as binary. After finishing with your changes click the Save button, or cancel the changes and go back by clicking the Cancel button. Make sure you click the "Next" button. Select the desired option(s) and click the "Prepare to Execute" button which unveils a generated Instance Data and/or Ontology form. 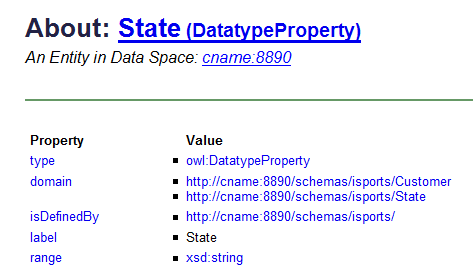 Apply the generated declarations (instance data and ontology) to your Virtuoso instance. Publish / Deploy declarations that expose the Wizard-generated Rewrite Rules and associated endpoints. 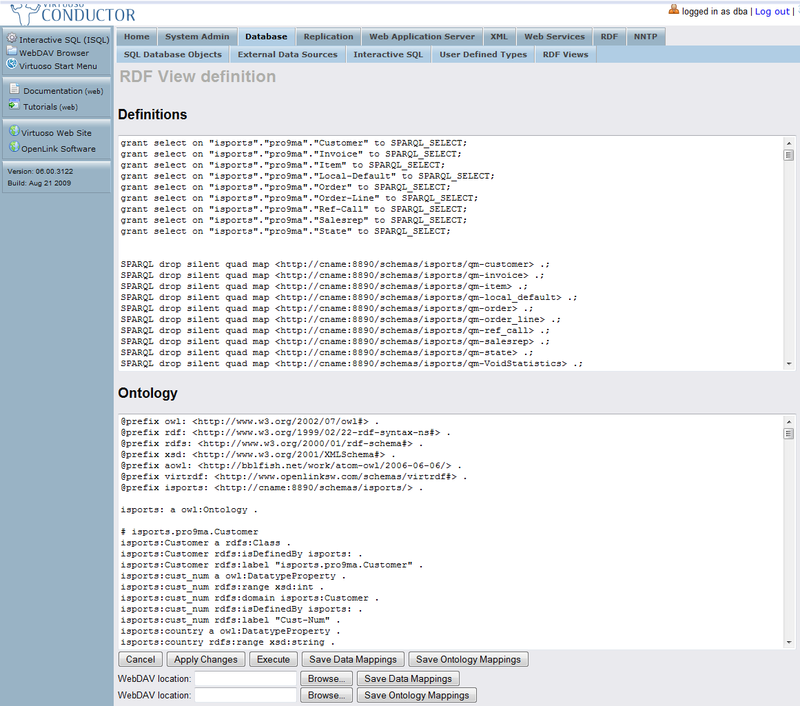 Click on one of the Instance Data Sample links to view some of the deployed Linked Data views. Click on the Statistics Data (VoID Graph) link to view the VoID Statistics. Click on the Ontology link to view the ontology information.